In light of my recent interest in nonfiction books, I've decided to start a new series to share the interesting, helpful, and sometimes surprising things I've learned. 1. Underemployment (working in a job that is beneath your education, talent, and skill levels) is worse than unemployment for both your happiness and your work-related future. 2. About 2/3 of lifetime wage growth happens in the first 10 years. 3. Weak ties (acquaintances we don't know well) are incredibly important for networking because they're different from us and, unlike our friends and coworkers, are more likely to have information unknown to us. 4. 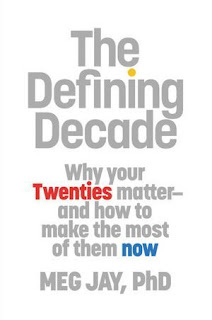 To prevent freaking out at age 30 (thinking, "I thought I'd have a great job by now" or "I can't be single when I'm 30"), you have to spend your twentysomething years working hard, having purpose, and being aware. You should never just assume that life will work out the way you've always imagined. Your 20s are not disposable years. Use them. 5. Twentysomethings who don't feel anxious or incompetent at work are usually overconfident or underemployed. Also, twentysomethings take negative work experiences especially hard. If you feel like your emotions are as fragile as a leaf at this age, remember to look at the big picture. 6. People don't really change after age 30; our thoughts and behaviors remain very stable. 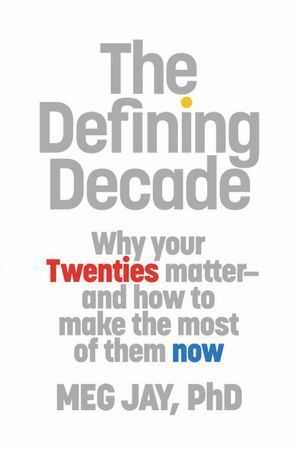 However, our personalities change more during our twentysomething years than any other time before or after. 7. Couples who live together before marriage have a much higher rate of divorce. Why is this? Jay believes it is because these couples slide into the choices (both cohabitation and marriage) without making a firm commitment. And once you live together, it is more difficult to break up because you have invested time, relationships (shared friends, your families), and money (shared furniture, rent, etc.) into the relationship. Never use living together as a "test run" for marriage. Founding a relationship on ambiguity or convenience makes failure much more likely. It is highly advised to wait until you are engaged to move in together (if not married) or to clearly communicate your commitment levels beforehand. Do you want to continue your education? Do you want to go to law school or medical school? How many years will you spend in grad school? Do you have to take the GRE, LSATS, etc.? How long will the application process take? What are your career goals? When do you hope to achieve them? Do you want to get married? When do you imagine being married? How long will you be engaged before you marry? If you want kids, how far into your marriage would you like to start the process? Do you want kids? When? How many? Will you be able to have biological children at the age you hope to get pregnant? (Over the age of 35, pregnancy is much more difficult.) Will you consider adoption? If you imagine your children having active grandparents, how old will your parents be at the age you want to have children? Surprised? Old news? Disagree? Please share! Also, if you have any nonfiction recommendations for me, please let me know. I'd really appreciate it! You should've been in my senior sem class. This was Dr. Waters every day. haha. She does make sure never to say "You must go to grad school! You must get married! You must have kids!" It's all "if." If you want to go to grad school, be sure not wait too long . . . If you want to get married, be weary of cohabitation . . . If you want kids, don't count on having them when you're older . . .
Oh my goodness, I have to read this. I just turned 27 at the start of the month, and I'm beginning to try to figure out what I learned over the past 7 years and what I'll be doing by the time I'm 30. So much pressure! I always find the studies about divorce rates and cohabiting couples interesting. I feel like NONE of my friends would get married before living together. It's one of the established steps now. But maybe that's because I live in LA, where you can't afford to live on your own in an apartment without being very, very rich. Do! It's a pretty quick read and it's full of interesting facts and tips. And I do too! It's always seemed strange to me that cohabiting couples have a higher rate of divorce. Don't they just know each other better? So they won't get as bothered by each other's weird habits and daily schedules and whatnot? The author's explanation does make sense, but I still find it baffling! And that's so interesting! I think my friends are about half and half. But I've heard in big urban areas, people do live with their partners more often and also get married much later. It makes sense, like you said, what with the rent being so high! Oh god, on behalf of your thirty year old readers - this is terrible! It's just stressing me out! But it seems like good enough advice?